American Airlines gave a handful of families who have children with autism a chance to face their fears with a trial run Saturday at the San Diego International Airport. Families taking part told NBC 7 that children who have autism can become extremely overwhelmed in fast-paced situations like an airport. “They have a lot of energy, and there can be a lot of noise sensory issues. Things like that, you know, make it a little bit different for them,” said Daniel Castillo, the father of six-year-old Elias and seven-year-old Nicholas. Elias and Nicholas both have high-functioning autism. The Castillos have a trip planned this summer, and Daniel thought a trial run wouldn’t be such a bad idea. Their family was among 50 other San Diegans participating in American Airlines’ It’s Cool to Fly program, which allows children who have autism to gear up for a mock flight. Elias and Nicholas, both first-time flyers, were ready for take-off. While the plane didn’t take off, it did taxi around the runway. “I think they’re going to be fine,” Daniel said. The now-five-year-old program typically takes about three and a half hours, according to American Airlines’ website. It’s Cool to Fly is free. The program was inspired by Bruce Sickler, an American Airlines employee who suffered an injury in 1993 that limited his mobility. The company said Sickler understands the difficulties of traveling with disabilities and paved the way for It’s Cool to Fly. 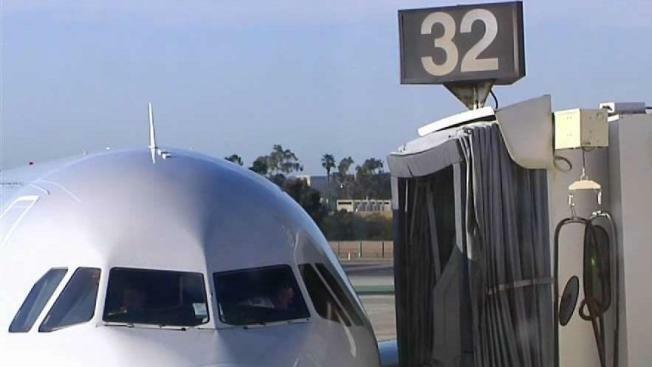 Saturday marked the first time American Airlines hosted a trial run for families in San Diego.